On a hillside to the north of Kilfinan a neolithic chambered cairn may be found, hidden away in the forestry. Erected four or five thousand years ago, it was a ‘dwelling for the dead’, no doubt reflecting in some way the view of the afterlife which people entertained in those days. 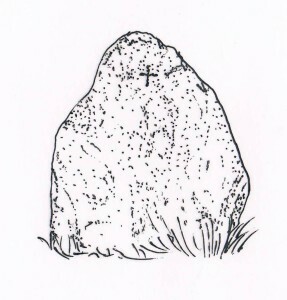 It is of particular interest to us because, apparently in the early Christian period, someone carved a simple Latin cross on one of the stones comprising the forecourt and entrance to the cairn. The cross carved on the stone finally revealed itself … only just. 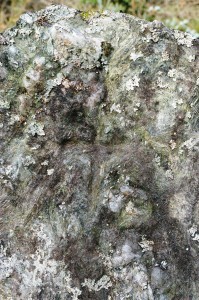 The stone is already so rough, so full of quartz and other lumps, that carving is not obvious. It is impossible to know now what exactly the carver and his or her community intended when they placed the cross here. Did they think that the cairn was a dangerous place, associated with the ancient dead whose spirits might harm the living who now walked the earth? In that case the cross might have been intended to control those dark forces and to protect the early Christian folk of Cowal from harm. At this cairn we may therefore imagine that early Gaelic-speaking Christians carved this cross as a prayer for the dead people buried there whom they saw them as their own unbaptised but beloved ancestors. They did so hoping that Christ, who died on the cross, would recognise them as his own. It is also worth noting that early Christians in the Gaelic world treated pre-historic burial mounds as boundary markers. They regarded the dead ‘ancestors’ inside them (whether they really were their ancestors or not) as a protective presence on the edge of their land defending their descendants’ claim on it. So a seventh-century family might bury one of their own in a pre-historic burial mound in order to express a perceived continuity between themselves and their supposed ancestors – thus expressing a continuing sense of their right to occupy the ancestral land. The place was recorded by Skene in 1834 as Clachan tagart. He doesn’t say where he obtained this name, but presumably it was a local informant. He translates the name as “priests stones” (without an apostrophe), and he understands it to be the name of the whole cairn. But it seems that he did not quite understand his informant. 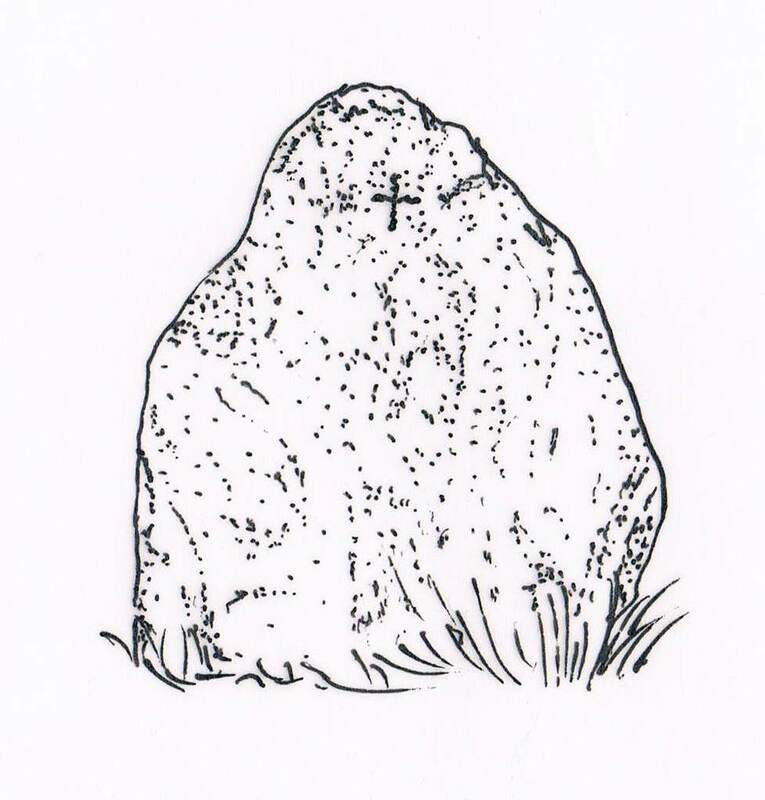 The name should be read as Gaelic clach an t-sagairt, “the priest’s stone”, and it is therefore not the name of the entire collection of stones which formed the cairn, but of a single stone. It presumably referred to this one. When you get to the cairn (which is in a clearing in the forestry) you will see the main axis of the chamber is aligned NE-SW. Go to the NE end and look at the two wings of the ‘forecourt’. At the far end of the left (east) wing there is a big stone standing up. Go to the other side of the stone, and you will see the cross. Go north from Kilfinan for two miles as far as the forestry of Ballimore (there’s a signpost on the right). If you are in a car, park it in the entrance of the Ballimore track (keeping it well tucked in to the side, to allow forestry trucks in and out). Walk back about 100 yards and you will see little yellow discs with black arrows pointing up the hill, nailed to the trees. Follow the arrows up the hill, through the forest, across a hundred yards of cleared area and back into the forest for another twenty yards (also marked by yellow/black discs). For an Ordnance Survey Map of the cairn and the surrounding area, including roads and footpaths, click on ‘View Larger Map’ below. We hope to erect a signpost on the roadside soon to show you where the track through the forest starts. In the meantime, if you’re feeling lucky, just use the grid reference given above, your OS map, and a handheld GPS instrument. And this map might be useful too. If you are coming by car and want to park on the opening of the Ballimore driveway, please park carefully as timber trucks come in and out here, and need to be able to turn. Tuck yourself well in to the side.